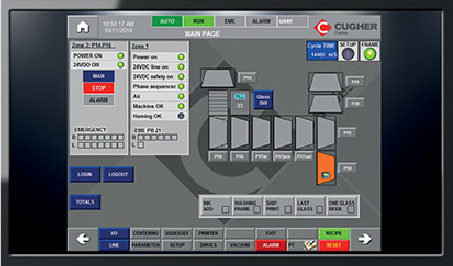 Dedicated software (PLC/HMI System), expressly realized to manage this line, allows the total control of the line and carries out the part tracking, managing all the emergency situations. 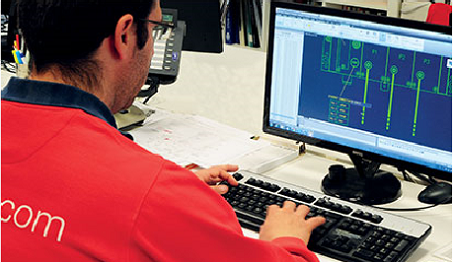 Adequate line control panels will allow the operators to control the printing area and the handling line. The main Panel shows a graphical view of the exact positions of the glasses on the handling line (parts tracking system), giving the operators a perfect idea of the line’s situation and the capability to manage all the situations. It is possible to store up to 200 different recipes, that can be recalled by the touch panel, to auto-set the machine for different glasses. Possibility to extend the number of stored recipes (included in the Line Supervisor System). General operation parameters for machine and dryers that are memorized inside our PLC/HMI System that allows a quick model change. The Remote Assistance System consist of a hardware that will be connected directly to the printing machine PLC and allows to perform a remote connection to the printing line. The system requires only to be connected to the internal LAN or to internet. It doesn’t require the operators work to connect the PC and run the software. Using the Remote Assistance System, it will be possible to intervene remotely on all the line’s parameters and give support to Customer technicians and operators in case of needs. No additional installation is required.